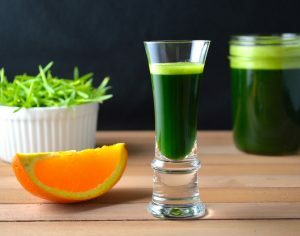 Taking a wheatgrass shot is not the most pleasant thing ever, but if you take one everyday, there are many great benefits that can come from it. To get the full benefits of wheatgrass and all it has to offer, it must come from a fresh, living plant. Wheatgrass juice is about 70 percent chlorophyll. Chlorophyll helps slow aging, is an important blood builder, a natural healer and can improve blood sugar problems. Since it helps slowdown aging, it only makes sense that it helps to keep your hair from turning gray. Wheatgrass juice purifies your liver and rids your body of toxins. Wheatgrass is high in oxygen, making it very beneficial for your brain. You can also get wheatgrass implants. “This is good for healing and detoxifying the colon walls. The implants also heal and cleanse the internal organs,” according to The Chalkboard. Dr. Earp Thomas found that an ounce of wheatgrass in a gallon of fluoridated water would turn the fluorine into a harmless calcium-phosphate-fluoride compound. He further discovered that fruits and vegetables contaminated by sprays were thoroughly cleaned and the negative food transformed with a wisp of wheatgrass placed in the water. Even if you live a gluten free life, you can still have wheatgrass because it is cut before the grain forms. Add a wheatgrass shot to your daily routine for a more healthy diet.